We can never seem to finish a loaf of bread but there are some days whereby we just crave for breads. This dish is a result of not being able to finish the load of oatmeal bread that I bought last week. This reuben sandwich is super easy to make. 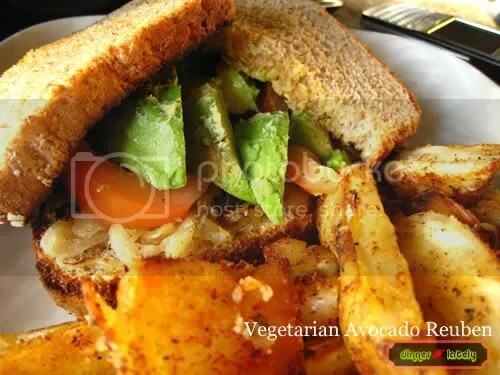 It is inspired by a sandwich called Pretty Woman at Stage Deli in Somerset Mall in Michigan. We always get this sandwich when we go to the mall. I did not make any homemade Thousand Island dressing for this sandwich this time because I didn’t have any mayo, but it was just as good with some Grey Poupon mustard. I’ll include the recipe for homemade Thousand Island dressing anyway. We made paprika potato wedges as a side for this. Spread butter and mustard (and Thousand Island dressing, if desired) on one side of the bread. Drain sauerkraut. Saute garlic and and sauerkraut with some olive oil in a pan until sauerkraut is dry. Season with salt and pepper to taste. Divide sauerkraut on 2 slices of bread. Place avocado and tomato slices, and 2 slices of Swiss cheese on top of the sauerkraut. Set the open face sandwiches and the 2 slices of buttered bread on a pan and broil in the oven for 30 seconds, or until lightly browned. Top the open face sandwiches with the toasted bread and serve while hot. Mix all ingredients until creamy and refrigerate until chilled. Well, guess what… I’m laid off! It sucked initially but I soon got over it. I don’t know why but I don’t seem to mind it too much anymore these days. It’s been almost 2 weeks since I received the somewhat predictable news over the phone during dinner time. If there was one thing that I am finally able to do (along with daily praying, chanting and more of yoga… and hopefully meditation down the road) is planning our daily meals. Planning our meals has a great benefit, i.e. controlling our budget. We are now trying to keep our food and transportation allowance to CAD$100 a week, which isn’t too bad at all. I buy almost all of my produce from the local farm market, where fruits and vegetables are fresh and cheap. 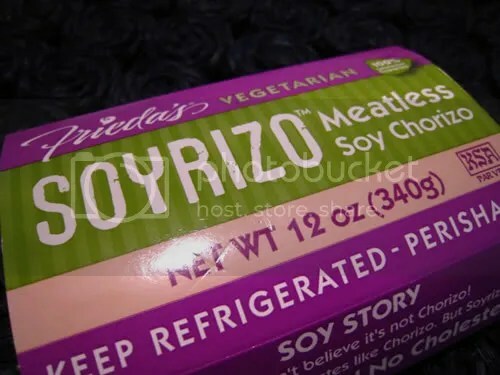 Once in a while, we splurge across the border at Trader Joes, Kroger, Target and Meijer to get cheaper vegetarian meat substitutes such as soy chorizo, which I managed to use this week. 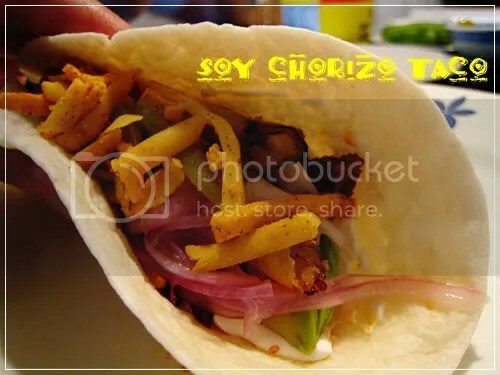 I first saw the original meat version of chorizo taco made by Danielle of Maple Syrup and Poutine in our cooking club meeting in January, whereby I was the host. The theme that I had aptly picked was “All Wrapped Up”. It was the dead of winter, so I thought the theme was very appropriate since we were all bundled up in layers of sweaters, scarves and jackets. 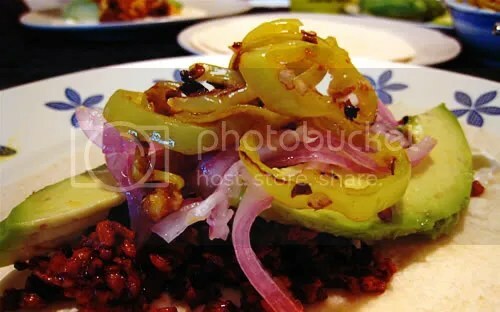 The original recipe is called Chorizo, Poblano and Yam Fajitas with Lime-Marinated Onions. I made some modifications to the original recipe, one was of course, using soy chorizo that can be found even at Walmart in Dearborn, MI. I also did not use yam this time, since Andy is not a big fan of them. Also, I used banana peppers instead of poblanos. One of the key things about staying within a budget is not to be too rigid with ingredients. Danielle used sliced avocados as chorizo substitute for me when she made it, and I loved it so much that I kept it in when I made my version. Also, instead of feta cheese, Andy found some Southwest shredded cheddar and mozzarella cheese. I have to say that it is not really necessary if you would like to use sour cream and avocado in this recipe. Also, I merely reheated the tortillas in the microwave wrapped in wet paper towels for about 50 seconds instead of reheating them over the stove. The meal was very successful. Thanks again, Danielle, for introducing this one ingredient that I had been curios of for quite some time already. I had 3 pieces of the tacos that night while Andy had 7. Yeah, he is my eating machine and I do have to remind him that we are on a strict budget these days… More pics below. I have a confession. I love alfredo sauce, or any cream-based pasta dishes. I also loved seafood prior to being a vegetarian, but I’m severely allergic to shellfish/seafood. 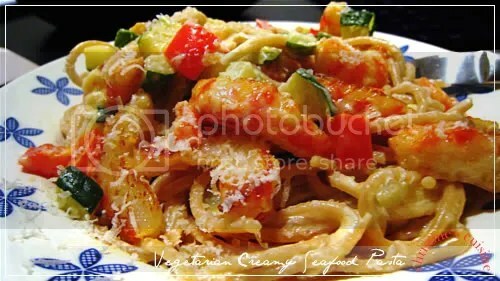 One mock meat that I love to use is vegetarian shrimp/prawn and so, I’ve incorporated it into this dish. You don’t have to use vegetarian shrimps if you can’t find them. The dish would still be very good. 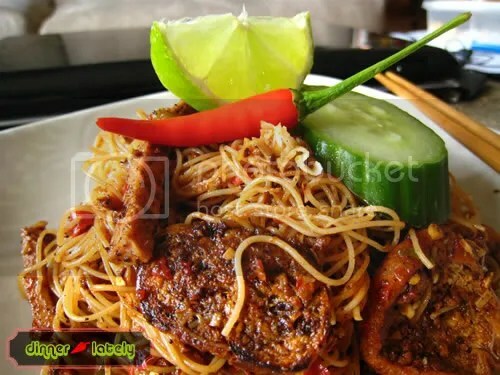 Vegetarian mock meats can be very expensive. Also, I love to combine my cream sauce with lemon, I think it gives it a nice tangy taste. Cook spaghetti/linguine according to package instruction until al dente. Drain pasta from water but reserve some of the starchy water to help thicken the sauce. Brown the shrimps in 2 tbsp of olive oil. Set aside. Add another tbsp of olive oil and cook minced garlic, cubed zuchinni and peppers over medium heat. Season with 1 tsp of seasalt. As vegetables begin to soften (about 3 mins), add the semi-cooked pasta. Stir thoroughly. Add cream and bring to boil for half a minute, then season with 2 tsp of salt. Turn off the heat. Add browned shrimps back into pasta. Add lemon zest, juice and grated cheese. It should thicken up or else use the leftover pasta water or more cheese. 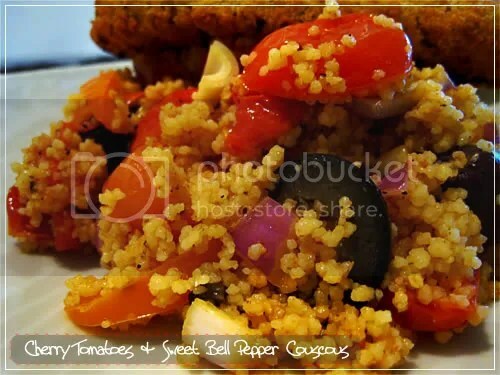 Serve while warm with a few cracked of black pepper if desired. I have made this dish a few times, but the last time I made it was the best. The sauce was just nice in terms of thickness and the “chicken” wasn’t swimming in the sauce. I can’t tell you how much of the ingredients to use, you’re gonna have to just eyeball it and see what works for you. It all depends on the amount of chicken used. I used snow peas and mushrooms this time for the sauce, but you can pretty much use any vegetable. Best served with a bowl of hot rice, or two! Deep fry the breaded chicken. Drain excess oil on paper towel. Set aside. Reserve 2 Tbsp of oil in the wok. Fry onions, garlic and hot pepper till fragrant but not brown. Add snow peas and mushrooms (or your preferred vegetables). Pour ketchup and water into the wok. Bring to boil. Season with sugar and salt. The sauce should be thick enough to coat the back of a spoon and you can use a finger to draw a line and the sauce stays separate. If sauce is too watery, thicken with cornstarch+cold water mixture and immediately remove from heat. Stir until combined. 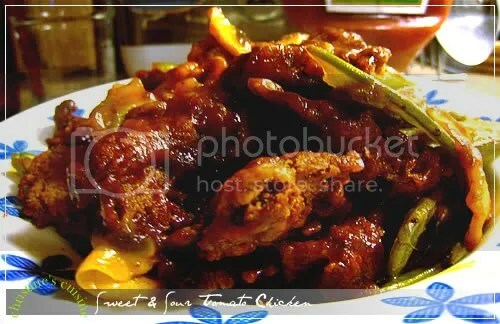 Toss fried chicken pieces into the wok to coat with sauce. Done! Note: I use Heinz ketchup and was told that Canadian ketchup is better because it is made with actual sugar instead of high fructose corn syrup (HFCS), which is bad for you. I found that Canadian Heinz ketchup does taste better than American Heinz due to this fact.